Figure 1: The Climate Lens feature, which allows users to explore different regions that will face an increase in the number of hot nights per year. The rise would have harmful health implications and possibly disrupt sleep patterns for those living across large cities in South Asia. The online platform Story Maps helps to better communicate climate change impacts and relevant adaptation measures in the Hindu Kush Himalaya to a wide audience, both to influence policy and for use at the community level. Robert Redford, the noted actor, philanthropist, and environmentalist, wrote a few years ago that the time is apt for the “pairing of scary statistics with inspiring stories”. For a layman, inspiring stories are preferable over statistics and numbers, whether scary or not. But what if a source existed that combined both, leading to immersive picture-driven narratives? This is the thinking behind Story Maps, a storytelling platform developed by ESRI, which is currently used widely as an effective mode of communicating a number of social and developmental issues. It allows users to choose from a variety of templates, to construct immersive storytelling that combines geospatial science and multimedia. Why are Story Maps relevant in the context of climate change in the Hindu Kush Himalaya? As climate change unfolds in the region in real time, there continues to be a yawning gap in the knowledge of climate change of scientists and other practitioners, and of those affected by climate change. Mapping stories of climate change not only contextualizes its effects by giving local examples, but also relates them to the relevant climate change data being produced. Funded by the International Development Research Centre (IDRC) and Department for International Development (DFID), the Himalayan Adaptation, Water and Resilience Research (HI-AWARE) consortia, working across the Hindu Kush Himalayan (HKH) region, is in the midst of capturing these narratives to better understand changing adaptation dynamics to climate change. A Story Map can combine interactive content (maps, figures, videos) about a changing climate and its impacts on different sectors with short explanatory texts. The HI-AWARE story map interface depicts existing hazards such as precipitation, heat stress, droughts, and floods, with map data showing future projections of these hazards for the HKH region. Along with these projections, each section describes the sectors being affected, and some existing adaptation practices. It superimposes this information on a regional map. Users can navigate through the story, step-by-step, using their web browser. The site-specific narratives are essentially there to provide the story-telling element to these examples. Among the standard mapping tools is a 'lens' that shows how climate is likely to look in 2050 (see Figure 1 above). Users can explore potential climate impacts by moving the ‘climate lens’ to their area of interest. One can look inside the rounded lens for the climate in 2050, and outside the lens for how the climate is currently. Figure 2: The webpage depicting heat stress affecting crop production and public health in South Asia. Relaying this information to a receptive audience, particularly those who will get affected, is essential. Although a lot of climate information is available nowadays, this knowledge often does not reach the wider public. Reports are seldom read and knowledge portals are often difficult to use. This is especially so in the case of climate change because it is a highly complex, long-term problem, often involving uncertainties at different levels. It also typically uses computer-modelled scenarios, which can be difficult for people to engage with. The key to sucessfully communicating messages lies in engaging with your public. Our ancestors knew how to do this, through the art of storytelling. Through collaborative efforts and technical support from Climate Adaptation Services, Netherlands, this platform is meant to highlight new climate change insights and engage and invite users to share their experiences of climate change happening across the HKH region, and how they may have attempted to cope with them. For decision-makers, it provides a compact and action-oriented overview, which combines climate impacts with successful adaptation practices. By combining information about climate change impacts, with information about adaptation measures, the story map highlights the urgency of climate action to policymakers. Figure 3: An example of heat stress adaptation with information regarding possible costs, success factors, and contact details of the organization testing the solution. Why the emphasis on crowdsourcing? This is partly to ensure the longevity of the findings, as a means of it being carried forward for other users. Crowdsourcing helps overcome limitations such as logistical costs of visiting and mapping climate change issues that are currently not within the scope of the organization. More importantly, it encourages a discourse on open-source information sharing and discussion. Furthermore, in a region with a large and growing ICT sector, the platform is an appropriate example of piecing together evidence, and encouraging collaborative spaces. The current limitation of such a platform is that it is restricted to internet users. On the other hand, it allows access to a key, select audience, in that it becomes an effective demonstration tool for policymakers and decision-makers. And for those who are neither academics nor planners, this tool holds immense potential in its capacity to show adaptation measures at work in the region. Another issue is the validity of the information involved – who would be the gatekeepers, and what parameters would be used to differentiate between good and average adaptation practices? For assessing this, a simple template has been devised, in which users can fill the required information needed in English to highlight their stories. They can submit photographs, their location, and a short description of their adaptation solution (Figure 4). This feature is still a work-in-progress, and is expected to improve with repeated interactions. A core committee that comprises of adaptation experts that are part of the HI-AWARE project, examine the submission. After it is vetted through the team the submission is circulated for review with all Co-Principal Investigators that are part of the HI-AWARE project. Only after they approval, does the work get published. Figure 4: The interface that allows users to submit their own solutions. The concept of climate change, as a distant, long-term process, can be a challenge for the human brain to grasp. 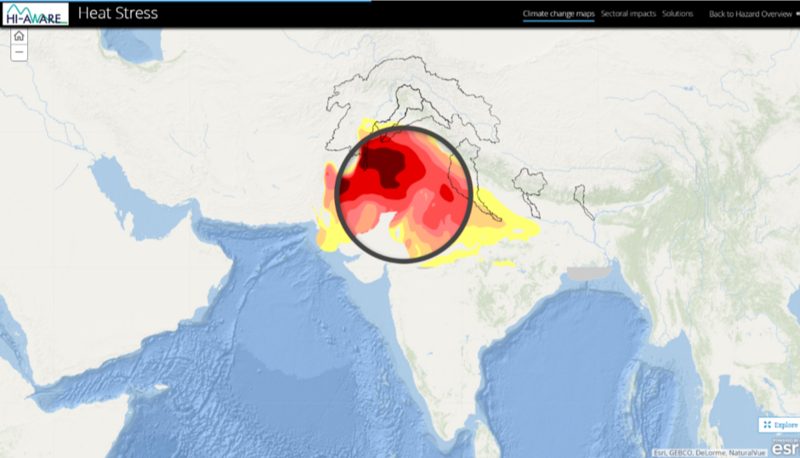 Story Maps provides an appealing new way to effectively tell the story of climate change by connecting compact scientific information to local anecdotes and bottom-up involvement in the Hindu Kush Himalayas. With the urgency needed for climate action, it provides a promising new option that deserves exploring. More importantly, this form of storytelling does not have a silent audience. Somewhere down the adaptation road, perhaps a community of practice can be put in place that uses such digital platforms for planning and decision-making. How is climate information being factored into long-term decision-making in Africa? How can we turn climate information into action? What makes a good climate service? Mung beans, cacao and climate: What do they have in common? This theme covers information and research for understanding and using climate data, communicating climate change and providing effective climate services. This case study considers how climate farmer field schools were established in Northern Zambia to make climate resilience an on-the-ground reality for smallholder farmers. This interactive primer explains what climate change scenarios are and how they are connected to socioeconomics, energy and land use, emissions, climate change and climate impacts. This Raising Risk Awareness (RRA) project analyses the role of climate change in affecting the hydrological regimes of Kenya, Ethiopia, India and Bangladesh. Survey on developing, supporting and using climate services - for building good practice! Learn to issue and package early warnings and create integrated communications strategies that support the value proposition for climate information, weather forecasts and NMHS in Africa. This article looks at the meaning and purpose of scenarios in the current IPCC Framework and provides answers to 10 of the most frequently asked questions, written in an accessible style. The Climate Knowledge Brokers (CKB) Group is a growing alliance of around 400 leading global, regional and national knowledge brokers specialising in climate and development information. Improving access and creating innovative ways to communicate climate risk.